HOW TO AVAIL THE NIKI CASHBACK OFFER? 2. Offer is applicable for existing PayPal users as well. 3. Now Pay on Niki app with PayPal. 7. 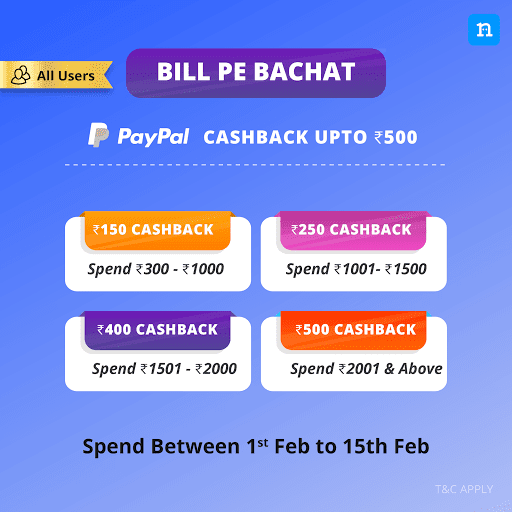 Cash Back will be credited to user’s PayPal account by 5 th March 2019. 8. Cashback can be used as a discount at any Indian merchant accepting PayPal within 60 days from the award date. 10. Cashback is not eligible for redemption on (1) send/receive money transactions (including those marked as a “Goods and Services” payments), (2) charitable donations, (3) purchases made using PayPal.me and Invoicing. 1. Cashback will be awarded only once per user. period is still valid. For partial cancellations, refund will be processed as per PayPal policies. account with PayPal, you&#39;ll need to download the PayPal app, login and check &#39;Offers&#39; section in the bottom part of the app homepage to find your cashback. protect the PayPal system. You agree that PayPal is under no obligation to disclose the details of its risk management or its security procedures to You.